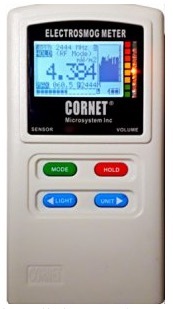 The Cornet ED88Tplus measures electric fields, magnetic fields and high frequency radiowaves (microwaves). It covers a very wide frequency range with good sensitivity. There are 2 ranges for magnetic, permitting the user to check for both very weak and very strong fields (up to 600 mG). This meter also shows the frequency of the predominant RF signal (up to 2.7 GHz). Includes a display, sound volume control with earphone jack, USB port for external power supply (for extended use), and data logging with PC interface and adjustable intervals. An illuminated bar indicates “danger” level with green/yellow/red LEDs which anyone can understand. Fits easily into a pocket or purse for easy travel. Includes sound/alarm and backlight, either of which can be turned off. Uses 1 standard 9V battery. Response is fast enough to measure “smart” meter pulses.